A warm wind blows through the Gulf savannah, sending fresh plumes of bulldust into the air. The dust chokes you, the heat is intense, the flies downright annoying. Welcome to Cape York. Well we’ve made it as far as Coen, a one-pub town about halfway up Cape York, after driving some 500km from Cairns, most of it on unsealed, potholed, dusty ‘roads’ – although creek beds would probably be a more apt description. The rainforest of the east coast has given way to eucalyptus , tussock, and rock, and the clouds to a bright blue sky and blazing sunshine. This is winter, but it’s 30 degrees in the shade. Even the crocs look hot. Yip, we finally saw one – a little freshie, not more than a metre long, lazing on a rock in the sunshine. Freshwater crocodiles are mean to be harmless, unlike their estuarine cousins, but we gave it a wide berth all the same. Along the trail we stopped in at Cooktown, Queen of the North they say, where Captain Cook beached his Endeavour when in need of repairs in 1770 something. He was the first white man the locals had ever seen, and when he sailed away again he was the last they saw for another 90 years. A gold rush in the late 1880s soon changed all that, and for a while Cooktown had 30 pubs and 100 brothels (or it might have been the other way around). No more though – it’s now got about three pubs and I couldn’t see any brothels, although I must admit I didn’t investigate this. The girlfriend and I stopped in for a meal and a game of pool at the Top Pub (we were rubbish) where the cook produced the finest chicken curry we’d had in years. Turns out she was Indonesian. A reminder that Cooktown is actually closer to Jakarta than it is to Sydney. 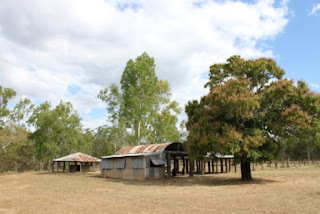 Cooktown is the end of ‘civilisation’ when you’re heading to Cape York – from there it’s a jarring, dusty, and sometimes hair-raising 700km or so to the top of Australia, where we’re headed. So far all the creeks we’ve had to cross haven’t been more than half a metre deep, which is really good, since our Chuckie isn’t equipped with a snorkel – de rigeur in these parts. But we’ve had our fair share of bumps and bangs, yet so far fingers crossed, Chuckie just keeps on truckin’. Tonight sees us by the banks of the Coen River, in a little free camping spot with a swimming hollow. We asked a local aboriginal if there were any crocodiles and she roared with laughter. “Nah, you’re sweet’’ she said. Good-oh, we replied, leaping in. “You’s might want to watch out for those water snakes though,’’ she added with a grin. She tells us three weeks ago a young girl needed to be airlifted to hospital after being bitten by a snake exactly where we were swimming. Bugger it, it’s 30 degrees, we’ll take our chances, we reply. Tomorrow it’s on to the start of the fabled Overland Telegraph Line, the OTL, and the route to the top of Australia. Good luck Katey! (and Colin). Love hearing what you are up to. Hi there, haha no not lost, more like lost reception! Telstra has a lot to answer for ... finally made it back from Cape York, just posted the blog from the top at Karumba, on the Gulf of Carpentaria: Claim to fame? "The only town accessible by sealed road on the Gulf Coast!'' Wahoo!